The original version of this article, by David Reed of the World Wildlife Fund-US, appeared on the World Wildlife Fund website as the executive summary of its new book, Water, Security and U.S. Foreign Policy. U.S. prosperity and national security depend directly on the prosperity and stability of our partner countries and competing countries around the world. Today, water-driven stresses are, with increasing frequency, undermining economic productivity, weakening governance systems, and fraying social cohesion. Water scarcity has created a context of human and societal need wherein water stress has undermined the vitality of rural livelihoods, driven broad migratory movements, become a weapon of war, contributed to the growth of insurgencies and terrorist networks, and given rise to increased demand for U.S. development, humanitarian, and military assistance. Water, Security and U.S. Foreign Policy, which is being released by World Wildlife Fund-US today at the Wilson Center, examines the implications and risks of water’s rapidly changing presence across our planet. To understand these dynamics, WWF-US engaged experts—including former ministers, negotiators of international water treaties, hydrologists, financiers, professors, managers of multilateral development institutions, and designers of water infrastructure projects—to analyze the genesis and current expressions of water-driven threats. Their analyses covered Mexico; three countries in Central America; Nigeria; Iran and Mesopotamia; Afghanistan and former Soviet countries in Central Asia; India and Pakistan; the Greater Mekong Subregion; and the Philippines. WWF-US asked the analysts to reconstruct the trajectories of their particular countries and regions of expertise to explain the driving forces that have shaped the social experience of water. Each analysis is summarized through what are called “paths of influence.” Within that framework, the analysts provide a concise summary of the ecological changes (with particular focus on water) unfolding in each geography, including ecological collapse, drought, groundwater depletion, salinization, and severe storms. Then, in a second step, the analysis of ecological changes extends to identify impacts on human systems on which societies depend, including the economy, rural livelihoods, infrastructure, and healthcare networks. The third step in the paths of influence is tracing how ecological changes are transmitted through human systems and lead to human responses in the form of social disruptions such as new migratory trends, local and ethnic conflicts, transboundary conflicts, and the rise of insurgencies and narcotics trade. The final step explores how, in the aggregate, these ecological and social changes negatively affect U.S. overseas and domestic interests. The most striking ecological changes are the frequency and intensity of extreme weather events, which have severe impacts on water access. Researchers in the book highlight the collapse of the Aral Sea and the virtual disappearance of Lake Chad and Lake Urmia in Iran as examples of the protracted drought experienced by virtually all countries under study. They make clear that ecological change, more often than not, is caused by human actions, including the drawdown and depletion of aquifers by farmers, mining companies, and municipalities. As communities deplete groundwater reserves, once-fertile lands have been rendered unusable in Central Asia, low-lying areas of the Mekong, Nigeria, Pakistan, and Iran. Countries in Central America, Pakistan, India, and the Philippines have been hammered by storms of unprecedented ferocity, displacing millions of families. As temperatures rise, countries in Mesopotamia, Central Asia, Iran, and Afghanistan are witnessing grasslands and savannas turning into deserts. The most forceful drivers of water crises are the failures to sustainably manage water resources. Too often, governments employ antiquated laws and regulations, promote unsustainable development projects, and fail to establish water conflict resolution mechanisms. Climate change exacerbates and accelerates those existing governance deficiencies. The most significant social disruption registered by the researchers is the erosion of the vitality of rural livelihoods, wherein the most vulnerable communities have few or no resources to absorb the impacts of ecological change, particularly protracted drought and falling levels of subsoil water. Such system-wide impacts lead to declining living standards, increasing food insecurity and vulnerability to subsequent economic or environmental shocks. Researchers point out that these downward pressures reinforce social inequalities as social elites tend to gain increased control over water and natural resources at the expense of the poor. Country and regional studies in the book highlight the devastating effects that drought and extreme weather events visit on infrastructure systems. Without adequate rainfall, turbines in hydroelectric plants are taken off line and fossil fuel energy systems lack water to cool generating plants. Urban areas in all regions have experienced regular disruptions in energy provision. The unprecedented force of storms in Central America, the Himalayas, and Southeast Asia have carried away bridges, factories, transportation systems, hydroelectric plants, and water filtration systems. 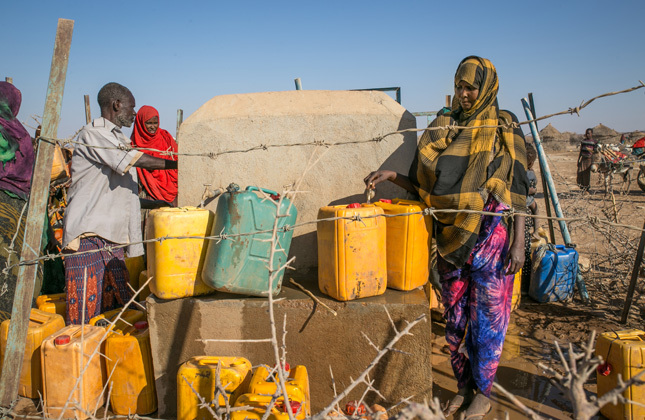 Recurring impacts of water insecurity on human systems also include rising pressures on health systems and repeated scenarios of humanitarian crises. The transmission of ecological change through human systems quickly reaches down to the community and household levels. Individuals and families facing reduced water supply, declining water quality and uncontrollable weather events often relocate in hopes of protecting their standards of living and finding security. Across the Northern Triangle of Central America, the Middle East, Central Asia, and Africa, millions of families have moved from rural homes to seek new opportunities in urban areas. Recently, migration destinations have shifted from neighboring countries to regions in northern latitudes thousands of miles away. The frequency of water conflicts is spiking in virtually all countries studied. The frequency of water conflicts is spiking in virtually all countries studied. Additionally, the diversity of those conflicts has increased. Competition among local communities, between rural and urban users, and among energy producers, extractive industries, agribusiness, and local companies has risen sharply as water supplies have diminished. Underlying many of those conflicts lie government actions, either perpetuating social and ethnic biases or proactively aligning with more privileged social groups and economic interests. In equal measure, transboundary tensions promise to intensify as governments take unilateral actions to protect domestic water supplies and provide for their demanding publics. While existing transboundary water agreements serve a vital stabilizing function, tensions and low-level conflicts across the Middle East, South Asia, Central Asia, and the Greater Mekong Subregion have become more intense. Emerging insurgencies have captured the growing discontent and desperation of the dispossessed as national and regional governments struggle to respond to basic community needs, including providing clean water. The rise of Boko Haram, Abu Sayyaf, the Islamic State, and the Taliban is linked to long-standing grievances over water access and the viability of rural livelihoods, as is the expanding narcotics trade in Central America and Central Asia. The disruptions in rural livelihoods and economic prosperity, the threats to the viability of governance systems, and the increase in widespread migration and insurgencies converge to create a multiplicity of challenges to U.S. interests around the world. They create regional instability that runs counter to U.S. efforts to promote economic growth, political transparency, and pluralistic societies. While water is not the sole cause of these disruptions, its influence and centrality is growing. Migratory pressures, not only across Africa and the Middle East but also in neighboring countries in Central America, challenge the ability of both friendly and adversarial governments to maintain social order. These movements involving millions of people weaken the ability of local and national governments to maintain the rule of law and retain their legitimacy as supporters of social well-being. In that vacuum of governability and legitimacy, insurgencies promising improved lives and social stability have captured the allegiance of new adherents, increasing threats to political regimes aligned with U.S. interests. Disruptions in global supply chains have remained relatively limited and, given the strength of the U.S. agricultural sector, most commodity price shocks probably can be absorbed in the near term. However, as weather extremes and drought intensify, price spikes and supply chain instability are becoming far more serious issues for many U.S. trading and political partners, and the consequences will be felt in growing instability in countries and regions of direct U.S. interest. Help partner countries strengthen their water governance and support their development goals by correcting distributional inequalities, building climate resilience, and strengthening the rule of law. Bilateral and multilateral assistance can help clarify ownership rights and responsibilities, establish clear price signals, and ensure the participation of civil society. Promote transboundary water agreements as a way of mitigating conflict, securing food supplies, reducing disaster risks, and promoting U.S. water, sanitation, and hygiene goals. Engender private sector investment in the water sector by strengthening managerial and technical capacity of water utilities; providing technical support and training to local investors to increase understanding of the financial structure of water projects; and supporting transparent and fair water pricing policies. Promote institutional reforms in U.S. government offices by establishing and resourcing an entity reporting to the assistant to the president for national security affairs; develop a comprehensive proposal in response to the Water for the World Act’s mandate to deliver a U.S. global water strategy; and expand financing for USAID projects in support of Sustainable Development Goal 6. Photo Credit: Member of WASH co Yaha-Jamal multi-village water supply shabele zone fetches water from a UNICEF supported water point, courtesy of Mulugeta Ayene/UNICEF Ethiopia.